"Wifi" stands for "Web Interface For... I", and is an add-on module which is not a standard part of OpenSimulator. It is provided by Diva Canto and can be added to OpenSimulator 0.7 onwards. Packaged binary versions of Wifi are available from http://metaverseink.com/Downloads.html in two packages: as part of the standalone Diva distribution (D2) of OpenSimulator, and another package for use with a ROBUST server grid implementation of OpenSimulator. The latter package (Wifi for Robust) is NOT intended to work with standalone implementations of OpenSim. Wifi provides an embedded Web application for handling user registrations. Wifi is a set of components that can be loaded up by both standalone simulators and ROBUST servers. 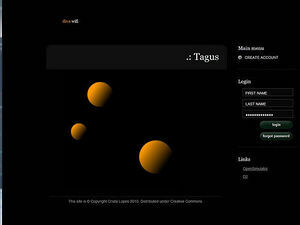 A welcome page which can be used as login page for the user's viewer. Wifi has a few interesting properties that make it a good fit for small-to-medium OpenSimulator-based virtual worlds. It doesn’t require an additional web server; it’s all done with built-in OpenSimulator features. Using OpenSimulator features bring many technical benefits. These benefits aren't visible immediately, but it will show its value in the future. Unlike other Web apps that access the database directly, Wifi works by communicating with OpenSimulator directly. This means that any future changes to the OpenSimulator database structure, will not affect Wifi. Technically speaking, Wifi is a set of components that can be used by both standalone sims, as well as ROBUST (Grid) servers. Obtain the latest Wifi module distribution zip from http://metaverseink.com/Downloads.html and place the files as instructed in the equivalent locations in your OpenSimulator directory. Copy WifiPages directory and its contents to OpenSimulator top level directory. Copy over the WIFI related readme, release notes and licence text files. For grids, edit Robust(.HG).ini in section [Startup] to add 8002/Diva.Wifi.dll:WifiServerConnector to ServiceConnectors. For standalones, edit StandaloneCommon.ini in section [Modules] to add WifiModule = true. Add a new section [WifiService] from example at http://github.com/diva/diva-distribution/blob/master/addon-modules/Wifi/Wifi.ini.example to Robust(.HG).ini (for grids) or StandaloneCommon.ini (for standalones). Note that it will be usual to specify the port number to be accessible outside your firewall (normally port 8002) rather than the default Network Port for internal inter-component OpenSimulator traffic (normally port 8003) which can be set to only be accessible within a firewall. ;; Do you want to be able to control grid registrations? ;; Syntax: AvatarAccount_<AvatarType> = "<FirstName> <LastName>"
;; Appearance and attachments are copied from avatar <FirstName> <LastName>. ;; Users will get email notifications from this account. Then login to the world under each of those accounts, and set their appearances however you like. You can add prim attachments. The port used for the Wifi HTTP service is configurable. Usually this will be 8002 for a grid and 9000 for a standalone unless you use custom ports. In either case, define the equivalent WebAddress in the [WifiService] section of your StandaloneCommon.ini or Robust(.HG).ini (or addon-modules/Wifi/config/Wifi.ini if used in future). If you do not use the usual OpenSimulator service ports, please note that some network setups and ISPs will not allow HTTP to be served on port 80. It is usual to use an alternative port such as 8080 or a custom port in that case. If authorisation is set to be on, you will receive an e-mail to the nominated admin account e-mail address if a user requests a new account and avatar creation. You can activate or delete new user creation requests. Users are notified of the activation via an e-mail to their nominated address. You can also search for users and change their details. Give a space as a search term to select all avatars. Available are fields for "Level", "Flags" and "Title". You can manually reset a user's password by typiing into the password box and the nhitting the "Reset" button. Note that the user is NOT infromed of this password reset, so you must manually contact the user to communicate such a password change. Note that the Wifi admin username/avatar is set in the Wifi configuration, and can be changed there. BUT.. once an admin always an admin. Well almost. If you change from one admin to another, the previous avatar still has administrator rights. You can remove Wifi administrator rights from an avatar by changing the "Level" of the user from 100 to the normal avatar level of 0 using the Manage Users facility in Wifi. You can set an intermediate level for a privileged user which can be used to allow certain types of Wifi menu that a normal user will not see, but that are less than full admin user rights. A configurable parameter sets the Level above which this functions for a user (default 50). A facility to add LINK REGIONS is available in Wifi versions for OpenSimulator 0.7.1 onwards. A feature in Wifi versions for 0.7.1 onwards and available to administrators via the CONSOLE link if suitably enabled. 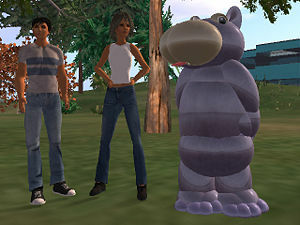 The WifiConsole uses OpenSim's REST console and thus the Robust server and any simulators must be started with parameter "-console rest". Furthermore, the configuration options "ConsoleUser" and "ConsolePass" must be set in section [Network] and the values of these options must match across all instances. Finally, for all region simulators (i.e. except for the Robust server), option "ConsoleAllowedOrigin" must be set to the same value as option "WebAddress" in section [WifiService] of the Robust configuration. Please note that as at February 2011 the console in Wifi is not much more than a proof on concept in its current state. It has been tested on web browsers based on Mozilla (i.e. the Gecko Engine) only. Browsers using the WebKit engine do work somewhat, too, and IE has its own issues. The console also does not yet work with any interactive input, as necessary for creating a new region with "create region", for example. Right now, there is no way to use this feature in a secure way because the values for "ConsoleUser" and "ConsolePass" are transmitted as clear text over the network. Please keep this in mind when using the console in Wifi.